Here's what i found out about felting. 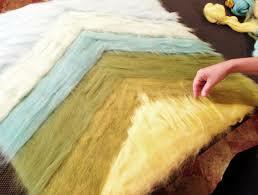 In the wet felting process, wool fiber becomes felt when you apply hot water, soap, compression, and agitation. The process makes the microscopic scales on each wool fiber open up and interlock with adjacent fibers. The wool shrinks and locks together, creating a thick, durable fabric. When I felt a vessel, I am again engaged in the creation of the fabric, with my fingers in it, watching the textures form and the colors interact. But instead of days and weeks, I often can make a vessel, from concept to finish, in just a few hours. It’s easy to try things out, and not so expensive or discouraging if something doesn’t work. For me, it offers almost instant fiber gratification and total design freedom. The humble out of this universe gila skilled Designer. Everything he touches turns to gold, including these homeless rocks and green spiky things. Gerald is a fashion and accessories designer, he masters the sewing machine both with fabric and leather. He is also skilled in handcrafting and hand stitching leather, Gerald has designed numerous products for 34 in the past. We don't know when his workshop is going to be, its probably a one-of because Gerald wants to design bags. For this workshop, Ged will be bringing a bunch of everything, he will show you how he works, after that its free for all. Do it the Ged way, your way or both. Free and easy, fun. Gerald will tell you all about the species, focusing on what you need to do to keep the plant happy, when its back home with you.